At 16-2, the best start by any big league team in over 30 years, the Boston Red Sox don’t need a lot of help right now. But that’s exactly what they’re getting in the form of lefty Drew Pomeranz. 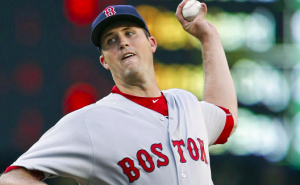 The Red Sox have activated Pomeranz from the 10-day DL in anticipation of his season debut Friday night against the Oakland Athletics. Pomeranz suffered a forearm strain during spring training that forced him to start the season on the DL. But after two minor league rehab starts, he’s ready to rejoin the Red Sox rotation. Pomeranz actually requested a second rehab start so he could fine-tune some things. The Red Sox are hopeful that Pomeranz doesn’t skip a beat from what he gave them last season. In 2017, the 29-year old lefty went 17-6 with a 3.32 ERA. He also defied his reputation as being an injury-prone pitcher and gave Boston 32 starts during the regular season. Despite a slight setback in March, the Red Sox are fully aware of how good Pomeranz can be if he can replicate his performance from last year. Of course, the Red Sox aren’t exactly hurting for rotation help at the moment. Boston’s starters are currently 12-1 with a 1.98 ERA on the season. Aside from Sale and Price being at the top of their game, Rick Porcello is 4-0 with a 1.40 ERA in four starts, numbers reminiscent of his Cy Young campaign two years ago. Eduardo Rodriguez, who also began the year on the DL, has also looked sharp in his past two starts. With Pomeranz back in the mix, the Red Sox now have their ideal starting rotation in place. On paper, it’s a group that looks like one of the most talented rotations in baseball. Thus far, they are living up to the hype, even without Pomeranz. On top of that, Steven Wright is also working his way back from injury. The Red Sox also got quality outings from Hector Velazquez and Brian Johnson while waiting for Rodriguez and Pomeranz to return. The depth Boston’s rotation has at this point is almost unfair. It’s hard to imagine the Red Sox being able to make improvements on a team that has started the year 16-2. But with Pomeranz returning from the DL, that appears to be the case. If he picks up where he left off last season, the Red Sox should have no problem continuing to hold a substantial lead atop the AL East.